Although Canavan disease may occur in any ethnic group, it affects persons of Eastern European Jewish ancestry more frequently. About 1/40 individuals of Eastern European (Ashkenazi) Jewish ancestry are carriers, about 1:10,000. 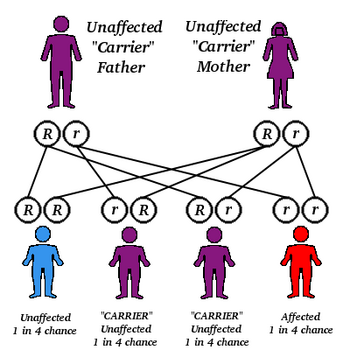 Canavan disease is inherited in an autosomal recessive fashion. If both parents are carriers, there is a 25% chance to have an affected child. Genetic counseling and genetic testing is recommended for families who may be carriers. Canavan disease is caused by a defective ASPA gene, responsible for the production of the enzyme aspartoacylase. This enzyme breaks down the n-acetyl-asparate acid, which is a toxin. With decreased levels of aspartoacylase comes an increase in n-acetyl-aspartate, which interferes with growth of the myelin sheath of the nerve fibers in the brain. The myelin sheath is the fatty covering surrounding nerve cells that acts as an insulator, and allows for efficient transmission of nerve impulses. Symptoms of Canavan disease, which appear in early infancy and progress rapidly, may include mental retardation, loss of previously acquired motor skills, feeding difficulties, abnormal muscle tone (i.e., floppiness or stiffness), poor head control, and megalocephaly (abnormally enlarged head). Paralysis, blindness, or seizures may also occur. There is no cure for Canavan disease, nor is there a standard course of treatment. Treatment is symptomatic and supportive. The life expectancy of Canavan patients is not known because new treatments have extended their lives beyond earlier projections. Today, Canavan children often survive into their teens and beyond. Until recently, there was absolutely no hope for Canavan children. Paola Leone, Ph.D. and her team are the only researchers in the entire world working directly with Canavan children. Dr. Leone and her team have pioneered a brain gene therapy to halt the progression of the disease. Their research offers a glimpse at treating and eventually eradicating similar degenerative diseases of the brain, such as Parkinson's disease, Alzheimer's disease, Lou Gehrig's disease (ALS), and Multiple Sclerosis. Dr. Leone and her team are currently at the University of Medicine and Dentistry of New Jersey, in Camden, New Jersey. The brain gene therapy is conducted at Cooper University Hospital. The procedure involves the insertion of six catheters into the brain that deliver a liquid virus containing 600 billion to 900 billion viral particles. The virus is designed to replace the aspartoacylase enzyme. Children treated with this procedure to date have shown marked improvements, including the growth of myelin with decreased levels of the n-acetyl-aspartate toxin.